Summer and slices of sweet, juicy watermelon are inextricably linked in most people’s minds. State fairs, picnics and family reunions are the usual excuses for buying one of the twenty pound giants that are shipped in from Georgia, Florida or Texas, but advances in hybridization now allow gardeners with not much garden area living as far north as Wisconsin to grow their own. Newer varieties of watermelon take up less room, the fruit is smaller in size and the time the fruit takes to mature has been reduced from over 100 days to 75-80 days. If you can grow cucumbers, you can grow watermelon. All varieties of watermelon have the same basic requirements: food, sunshine, high temperatures and water. 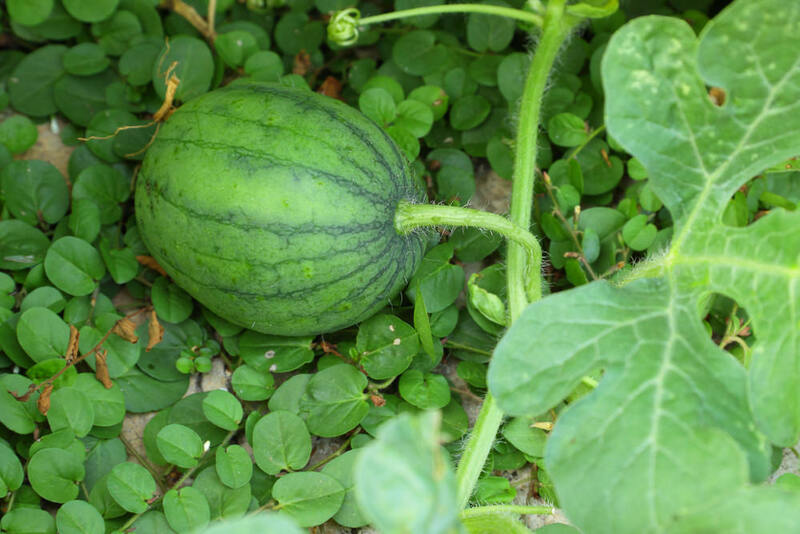 Because watermelon are heavy feeders, it’s a good idea to fortify the soil in your watermelon patch with generous amounts of compost or well-rotted manure, or a cup of slow-release all-purpose fertilizer per hill. 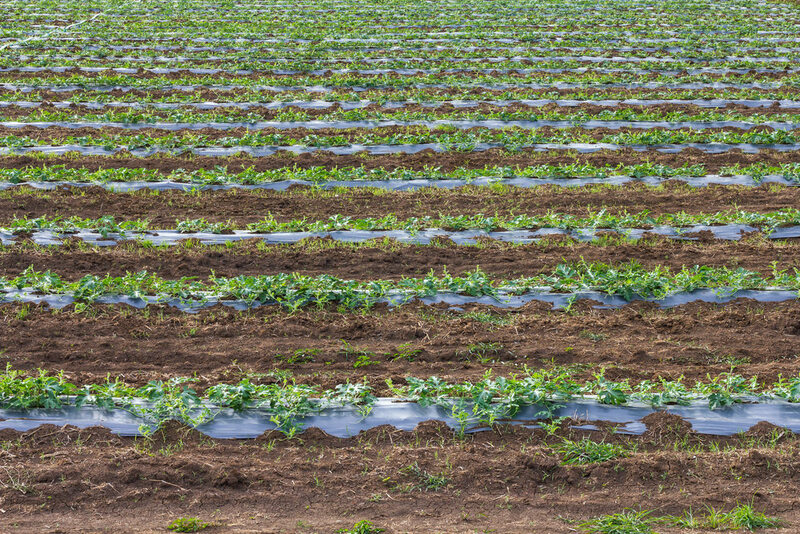 The watermelon patch needs to be positioned where it can receive a minimum of six hours of sunlight a day. Anything less than that and the fruit size and sweetness will be adversely affected. Watermelon is native to subtropical Africa, and days approaching 90 degrees with high humidity make the plants very happy. If these conditions aren’t normal for your area, cheat a little. Use black plastic mulch or black landscape fabric around your plants. The black plastic will increase the soil temperature around the plant. If you have particularly cool summers, fill some plastic jugs with water that is tinted dark brown or black with food coloring, and place one jug beside each hill. The dark water will heat during the day as it absorbs the sun’s rays, then release heat at night. Both the mulch and the water jugs will help create the warm environment that watermelons love. Finally, watermelons love water; consistent, deep watering of the plants during the growing season is a must. If possible, avoid sprinkling the leaves; the plants are prone to fungus. 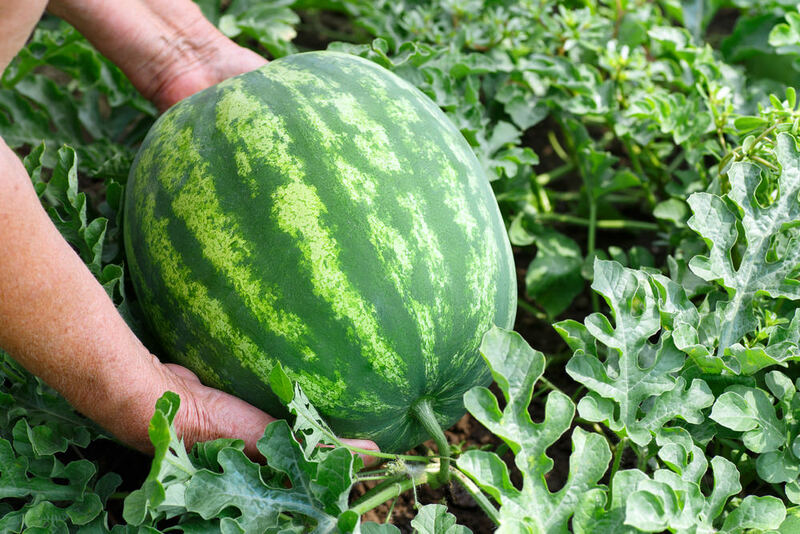 Deep watering methods such as drip irrigation or watering the base of each hill with a bucket or watering can are good ways to ensure your melons will turn out large and juicy. An oval melon of 15-20 pounds is what most people envision when they think of watermelon, but newer varieties are smaller in size. One of the newest arrivals on the scene is the “personal size” melon, which grows as large as a softball and serves one person. These are the better choice for home gardeners, especially those in northern states. Both vine and fruit are compact, reducing the amount of space needed to grow a crop. Smaller varieties also take less time to mature, so gardeners who routinely have to be concerned with frost dates as early as September can still enjoy a crop. Melons and other members of the cucumber family are grown in “hills”, or groups of four to five plants. Hilling melons ensures good pollenation, which is critical for fruit production. Melons have male and female flowers, and depend on the bees (and at times, human intervention) to transfer pollen from flowers of one gender to another. So, the easiest way to start your melon seeds is to start and transplant pregerminated hills. 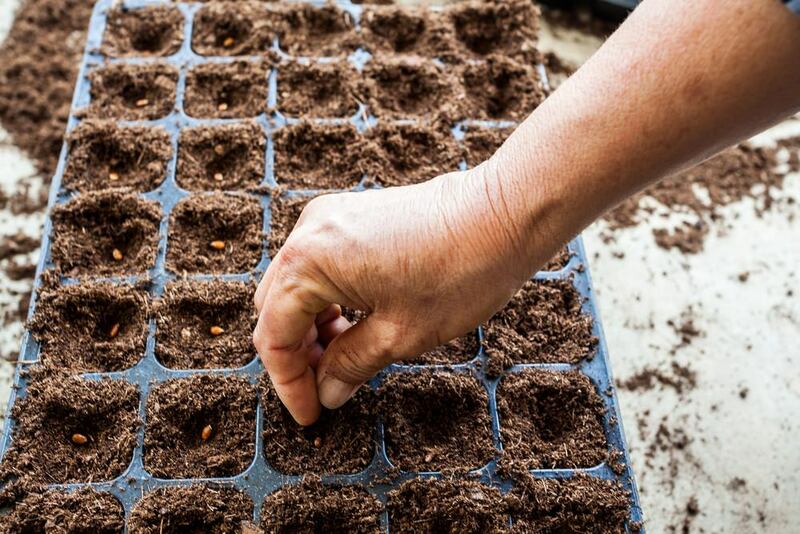 Fill a 6″ or 8″ flower pot (plastic or terra cotta) with a quality seed-starting medium. Moisten the medium, and then plant four or five melon seeds at equal distances around the edge of the flower pot. 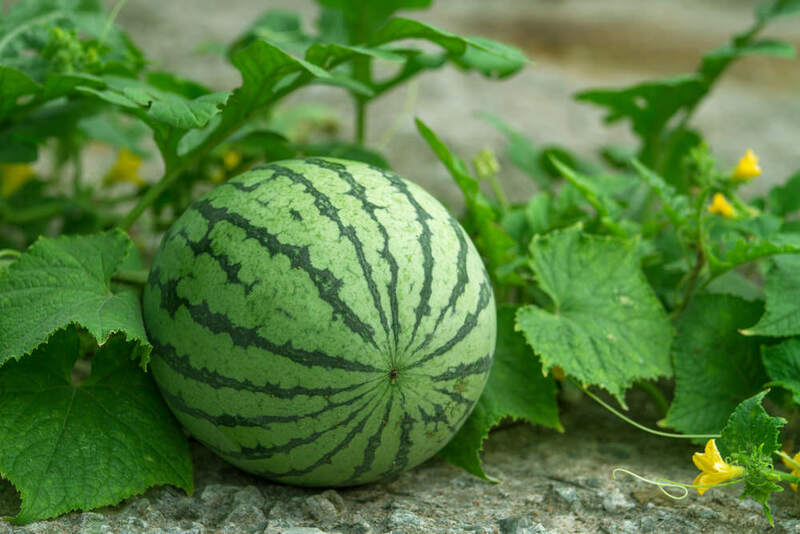 If you are growing a seedless variety, be sure that you plant one pollenator (a second variety of melon – these seeds are usually provided) in every pot; seedless melons only produce female flowers. Put the pot in a large plastic bag, and place it out of sunlight in a warm room. Melons germinate best in temperatures of 85-90 degrees, so a room near your furnace or clothes dryer is a good choice. Within a week, your seeds should be up. When your seedlings begin to show true leaves, remove the pot from the plastic bag, and put it outside in a protected area to harden off. Keep the soil moist, but not sopping wet, and allow the soil to dry out between watering. This move helps your melon plants adjust to the realities of life in your garden. After a week or two of hardening off, you can transplant the entire pot of melon plants into the garden. Dig a hole that is twice the depth and diameter of your pot. Add a few scoops of well-rotted compost or leaf mold to the bottom of the hole. Turn your pot upside-down, tap the bottom of the pot, and the entire mass of plants should easily fall out into your hand. Place this unit into the hole, taking care not to break the stems or leaves, or disturb the roots. Backfill around the plants with the soil you removed from the hole. Your melon hill is now planted and ready grow. Melon plants can produce vines up to 10 feet long, and this needs to be encouraged for maximum production. However, home gardeners may not have this kind of space available. Allowing melon vines to grow up, rather than out, is a way to conserve space and trellising melons actually improves fruit quality and production. Trellises need to be stable and made of strong material, as the weight of one vine laden with fruit can be 40 to 50 pounds. Metal trellising that is available at most garden centers, or one of the A-frame trellises covered with high tensile strength monofilament netting are the best choices; wood trellising may splinter and break under a heavy load. Trellising should be a minimum of 5 feet tall and extend 8 to 10 linear feet. As your melon vines grow and tendrils form, train the vines to grow up the trellis by wrapping the tendrils around the mesh, or an arm of the trellis. The plants will eventually grow up, clutching the trellis in a tenacious grip. This upward growth exposes the flowers, and makes it much easier for the bees to work their magic. Eventually, you will notice marble-sized fruit beginning to form. Trellising helps the fruit to develop a symmetrical shape and ripen uniformly. No longer will you have melons with an ugly yellow spot on the side that never saw sunlight, or have a melon that is flattened out from lying on the ground. More importantly, trellised melons can’t hide under the abundance of leaves the vines produce, so the shell of a rotting melon that escaped notice until after the plants were frost-blackened won’t surprise you. More fruit, better quality fruit, an easier harvest and economy of space are the many benefits of trellising your melon plants. When the outside of your melon is a uniform color (either yellow, deep green or striped) and it has a hollow sound when “thumped”, your melon is ready to harvest. Smaller melons can be stored in the refrigerator or a cool room, or split open and eaten on the spot. If the harvest is greater than the immediate need, scoop the flesh from your melons and freeze it in quart containers for later use. Many people use a melon-baller for this, but melon cubes freeze just as well and conserve space in freezer containers. And don’t forget the rind – the light green inner portion can be turned into a tasty sweet pickle. Growing one or two hills of watermelon makes sense for any home gardener. The plants are easy to grow, provide a steady stream of luscious fruit during the dog days of summer, and (shhh … don’t tell the kids), watermelons offer the benefits of lycopene and antioxidants in a sweet, low-calorie package.